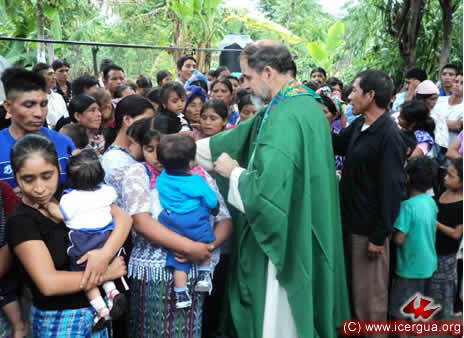 On July first, our bishop began his pastoral activities by visiting the Efusión del Espíritu Santo Community in Santiago Atitlán. 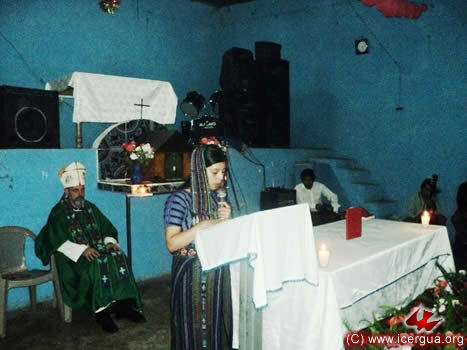 The occasion included the celebration of a child’s initiation into Christian life. In all the celebrations, music plays a very important role. In addition to the ministries that support the Charismatic Assemblies, this community also has a beautiful choir that accompanies the liturgical celebrations. The child that was initiated into Christian life belongs to a family that recently joined the Church. 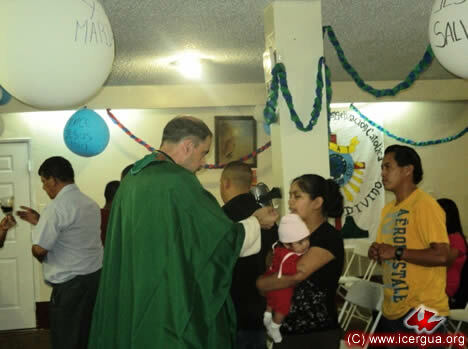 The bishop emphasized to the parents and sponsors that the efficacy of the baptism of children is closely related to the life of the parents. He stressed that the baptism of children always takes place in the context of the parents’ faith. 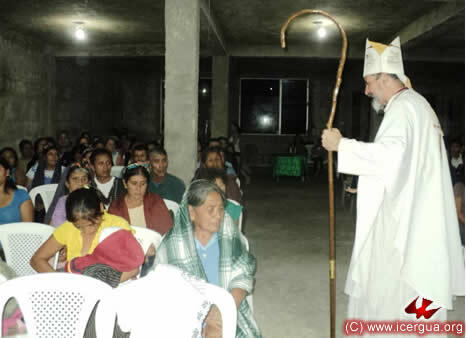 The bishop was accompanied by the teachers of TETYM in Huehuetenango. 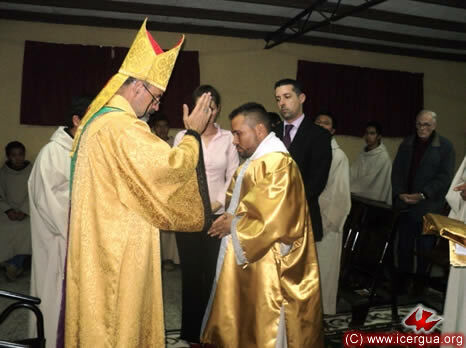 Seminarian José Alfredo Hernández served as acolyte and participated actively along with the community’s communion ministers, as can be seen in the photograph at left. 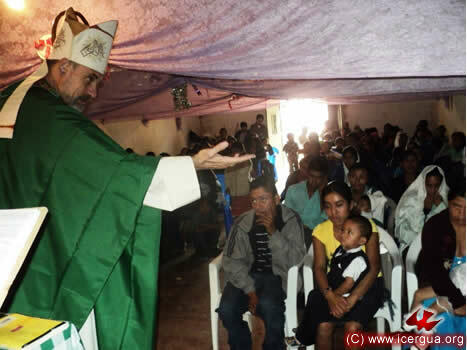 In late afternoon, during a torrential downpour, Monsignor Eduardo celebrated Eucharist with the faithful of the Pentecostés Community, also in Santiago Atitlán. 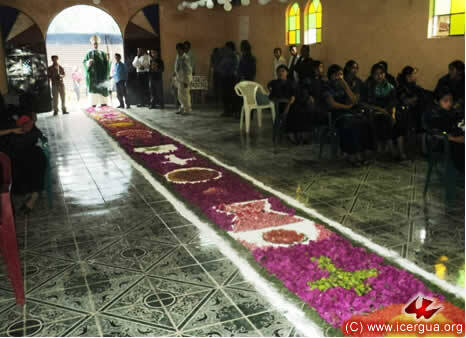 The community’s organization of its ministries has gone forward beautifully, particularly with respect to the ministries that are needed in liturgical celebrations. Left: One of the readers, who is proclaiming the Word of God. In spite of the adverse weather, there were many participants in the Eucharist. 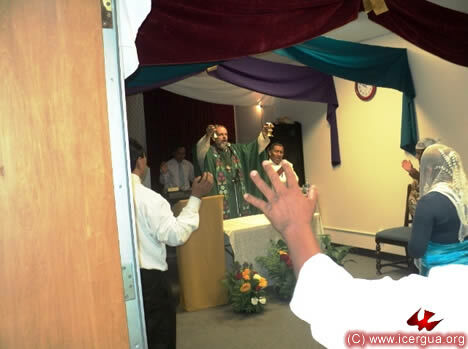 Many of the participants came forward to receive Communion, as can be seen in the photograph at right. 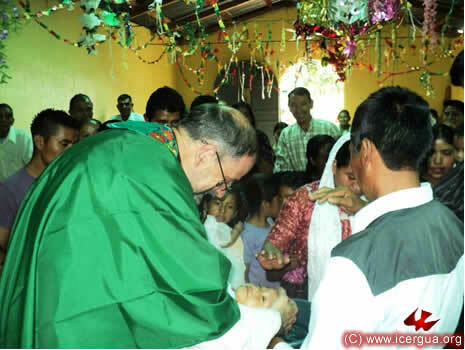 On Saturday, July 2, the bishop visited the Nueva Esperanza Community in La Democracia, Huehuetenango. 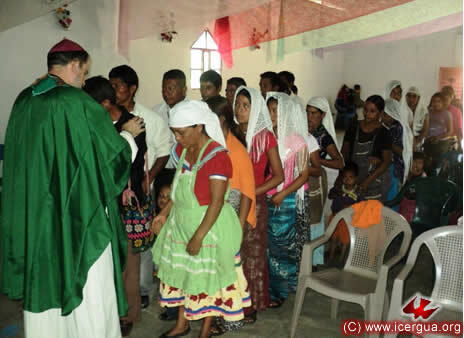 The church was full, for there were many special events: a couple contracted marriage, several children were initiated into Christian life, and some participated in First Communion. Recently, the community has accepted several new families into the congregation. In addition, many nearby communities have recently covenanted to form part of the Church. Right: The couple that have just exchanged marriage vows exchanging rings, signs of their love and the faithfulness that they profess for the rest of their lives. 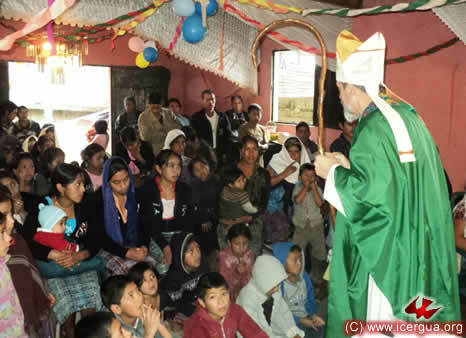 In the afternoon, pastoral needs took the bishop to the village of Pajales in the municipality of San Antonio Huista. The church building was full. 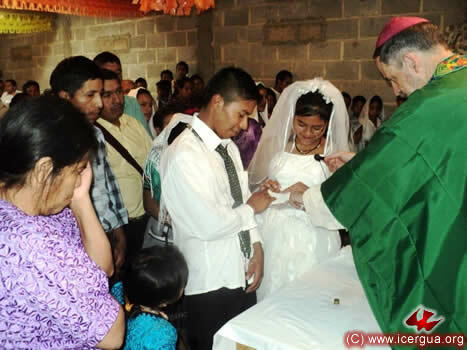 The celebration of a marriage had been prepared, several faithful, including adults and children, received initiation into Christian life, and some others participated for the first time in Confession and Communion. Recently the community has grown considerably. The underlying reason seems to be that many faithful from other churches have joined and become part of our church. 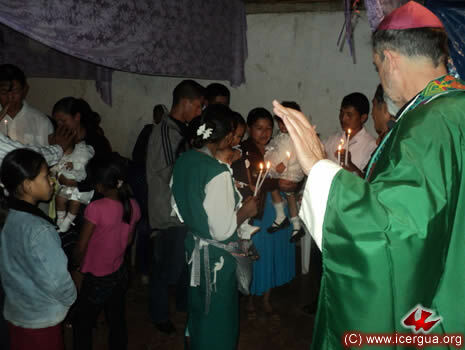 During the preparation for the administration of Christian Initiation, the bishop stressed that the children have to be supported by the witness of their parents’ lives so that the sacramental rites may acquire their true significance. 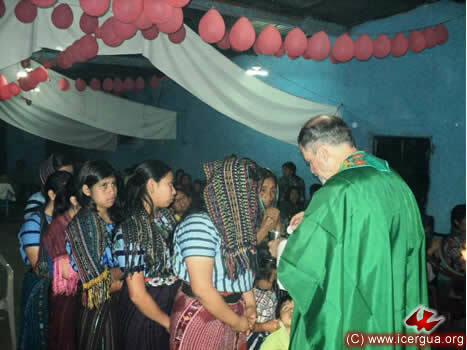 When the rites of Initiation were complete, the children’s parents and sponsors asked the Lord that the grace of the Holy Spirit which has been received may be maintained and produce abundant fruit. On Sunday morning, July 3, our bishop presided at the celebration of the liturgy with the faithful of the San José Ixcunén Community. This community covenanted with us last year. 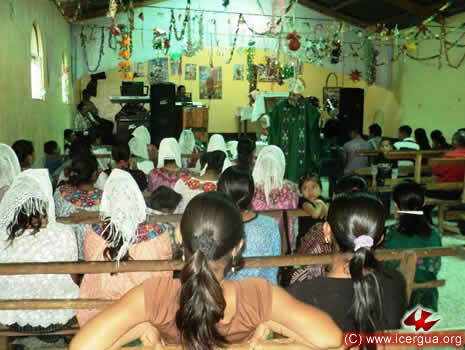 Since then, its growth has been steady, and the faithful are in the process of forming a new community in a nearby village. They invited him to visit this new community on his next visit. During the homily the bishop, speaking on the biblical lessons that had been read, dwelt on what it means to have a “real knowledge of God,” which is what the Lord gives to those who are humble and pure in heart. He stressed that this knowledge is experiential and is obtained through the presence of the Holy Spirit in the heart of the faithful. 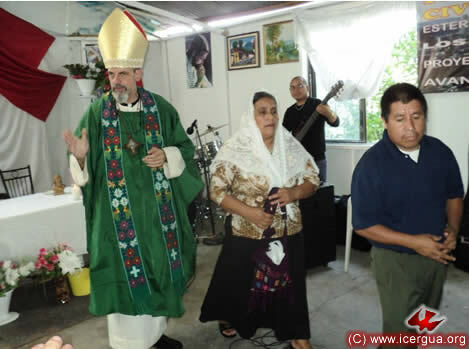 On Sunday at three o’clock in the afternoon, the bishop celebrated the Eucharist with the faithful of the La Vega, La Democracia Community. Four children had been prepared to be initiated into Christian Life through the administration of the sacraments of Baptism and Chrismation. 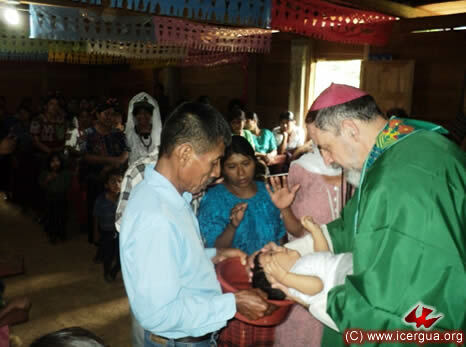 The bishop placed a special emphasis on the importance of the sacramental life and the witness of the children’s parents to ensure that the gifts received on the administered sacraments produce abundant fruits. 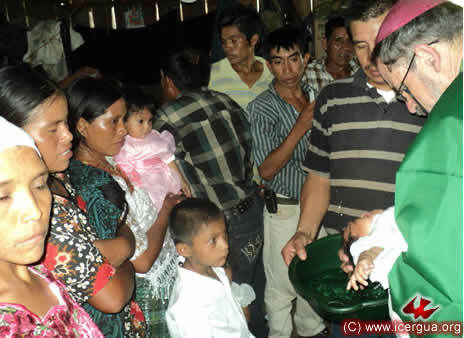 Right: The bishop, assisted by the active participation of the parents and the whole community, while sprinkling water on one of the children being baptized. 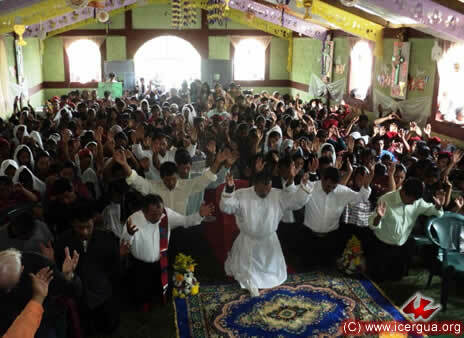 At the end of the ceremony of Christian Initiation, in keeping with our tradition, the parents and sponsors as well as some members of the community pray fervently over the children who have been initiated into Christian Life. 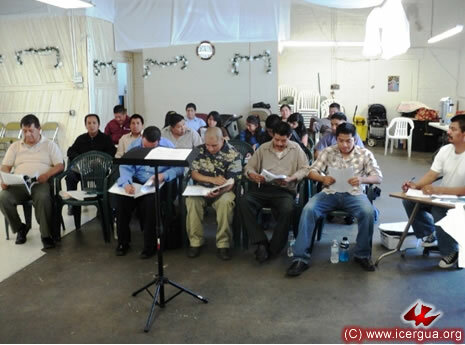 On Tuesday, July 5, the regular all-day meeting of the ICERGUA Presbytery took place. 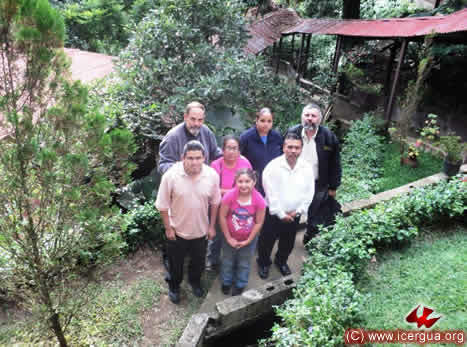 All the presbyters now working in Guatemala were present. The mood of the meeting was warm and friendly in every respect. Many pastoral issues were discussed at length, and some aspects of the basic constitution of our Church were defined. 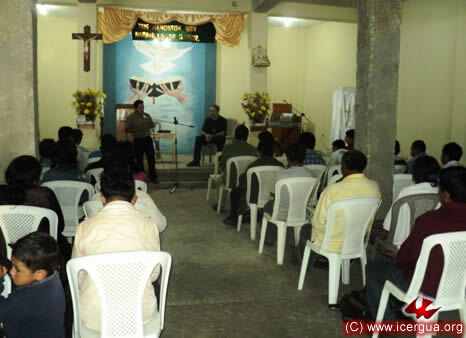 Left: One of the sessions of the Presbytery. 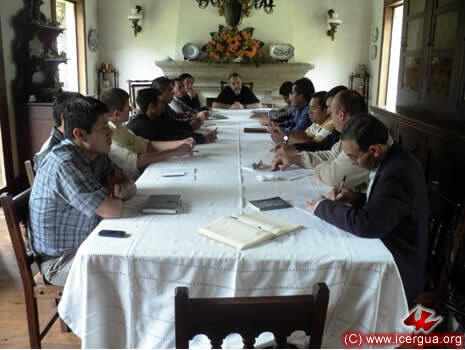 Among the Constitutional issues discussed is the distinction between the functions of the Presbytery, which consists of all the active presbyters in ICERGUA, and the Presbyterial Council, which consists of the Bishop, the Dean and General Vicar, the Vice-Dean and General Pro-Vicar, and the Secretary. In general, all decisions are the responsibility of the Presbytery. When an issue requires an immediate response, the Presbyterial Council has the power to make temporal solutions, which must be submitted in a timely way to the full Presbytery for its ratification and confirmation or possible emendation. During the open periods, there were opportunities for a collegial sharing of thoughts and feelings. 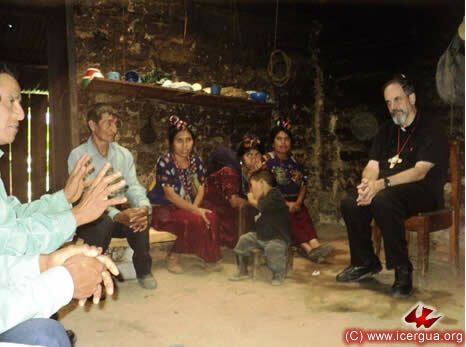 Left: Father Francisco Simón and Father Fredi Mux conversing with the bishop. 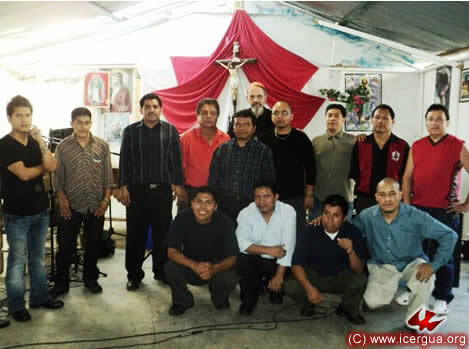 Right: Standing, from left to right: Fathers Francisco Simón, Pedro Martínez, Hugo Patzán, José Armando Hernández, Herberth Urrutia, Marcos Caicedo, Felipe Crimanya, Santos Acosta, Juan Moisés Mendoza, Fredi Mux, Marco Tulio Calderón (hidden behind other Fathers), Denis Obando, Bernabé Mateo, Gildardo Ramírez, and Fredy González. Front row: Father Rigoberto Upún and Monsignor Eduardo Aguirre. Left: A view which is similar to the one above, but in which can be seen some of the presbyters who are partially hidden in the other one. Since its beginning, ICERGUA has been concerned to develop a distinctive identity that is manifest in every aspect of our ecclesial and communal life. Part of this search was to develop our own version of the Divine Office. After several years of work, we published last month the version that we shall use, as was announced through previous months’ News. 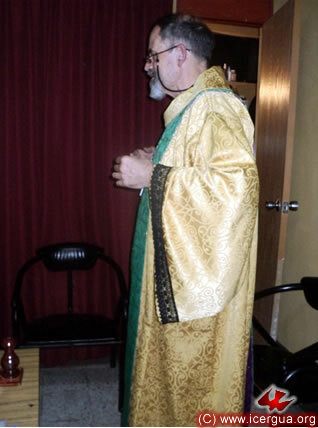 During the Presbytery meeting, the bishop presented the liturgical vestments that will be progressively introduced. The purpose of the presentation was for the Presbytery to analyze them and to suggest appropriate changes and, finally, to adopt them. It was unanimously decided to approve them in the form presented with some minor adjustments. The vestments consist of a broad tunic that functions as alb and chasuble whose basic color is gold. Above this is a long stole, which changes in accord with the liturgical seasons. The stole, whose lengths in front and back are equal, is distinctive only in that the last part in the front is divided. 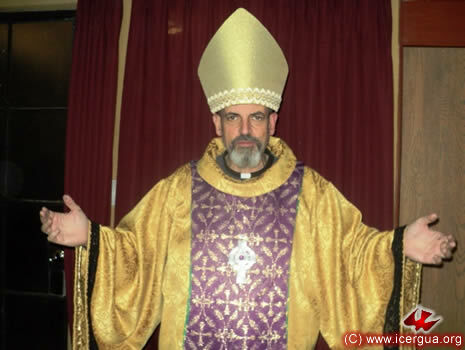 The only variation that the definitive version of the vestments will have is the width of the stole: it will be one inch wider, front and back, than in the model presented. All celebrants will wear a pectoral cross in front. On the evening of July 7, in a high Mass celebrated in the Seminary chapel, our bishop conferred the Holy Order of Sub-Deacon on seminarians Orlando López and Yaider Jiménez. 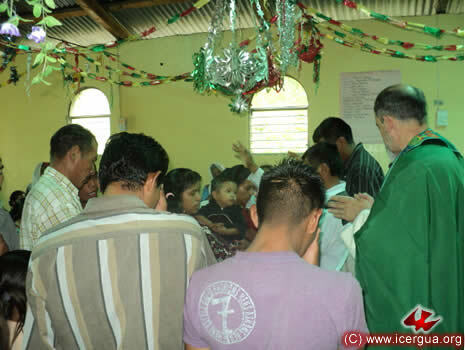 Through the order of sub-deacon they are incardinated into ICERGUA, become perpetual members of the Community of Saint Mary of the New Exodus, and vow to maintain celibacy for the sake of the Kingdom of Heaven for their whole life. 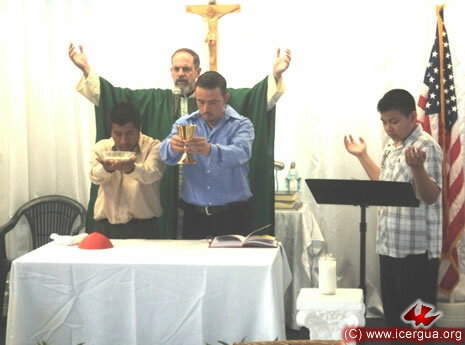 Concelebrating the Eucharist with Bishop Eduardo were Fathers Juan Moisés Mendoza, José Armando Hernández, Marcos Caicedo, Marco Tulio Calderón, and Pedro Martinéz. 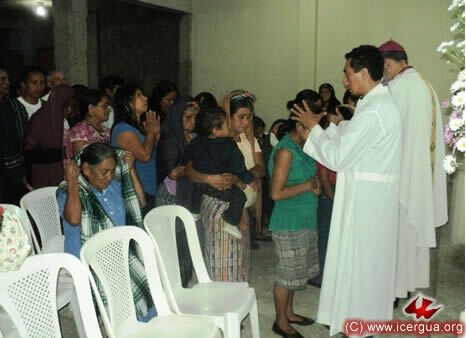 Do you freely desire to be incardinated into the Ecumenical Catholic Church of Guatemala in perpetuity, carefully observing celibacy for the sake of the Kingdom of Heaven as a sign of your love for and total commitment to Christ in order to be able to serve his People with freedom of soul and radical commitment? May the Lord grant that you may persevere in your holy promise. 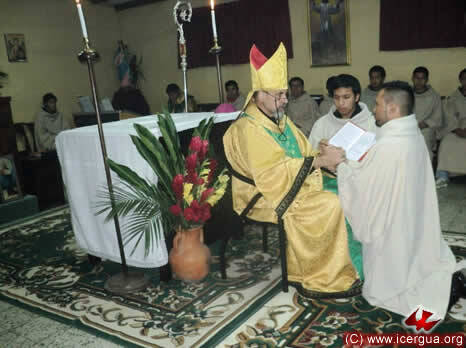 Above: Orlando López expressing to the bishop his promise to belong to the Communion and to observe perpetual celibacy for the sake of the Kingdom of Heaven. Left: Yaider Jiménez making the same promises. Let us pray, Brothers, to God the Father of Mercy that he may graciously pour the unction of his Holy Spirit on these his servants, whom he has called to the Order of Sub-deacons. With these words our bishop summoned the Assembly to prayer. Everyone knelt, the candidates prostrated themselves, and the Litany of the Saints was sung. We pray you to bless these chosen ones; hear us. We pray you to bless and sanctify them; hear us. We pray you to bless, sanctify, and consecrate them; hear us. Lord, our God, hear our supplication, confirm with your grace the ministry that we perform, and bless those who have been chosen for your service. For the sake of Jesus Christ, our Lord. Amen. O Lord, Father Almighty and eternal God, we pray you to send your Holy Spirit on these your sons, deigning to bless them with the fullness of your grace. You have desired to choose them to the holy order of sub-deacons. We pray you that they may be a holy temple of your glory; make them valiant and vigilant sentries of the heavenly hosts and faithful ministers of your holy altar. Receive the amice, which symbolizes your zeal in hearing the Word of God and your moderation in speech. In the name of the Father and of the Son and of the Holy Spirit. Receive the maniple, which symbolizes the fruits and blessing that through your good works will adorn the Church of Christ. In the Name of the Father and of the Son and of the Holy Spirit. That the Lord may reclothe you in the tunic of joy and the vestment of delight. In the name of the Father and of the Son and of the Holy Spirit. Receive the book of the Holy Scriptures and the power to proclaim the Word of God in the Church so that through your ministry the holy People of God may be instructed and blessed. In the name of the Father and of the Son and of the Holy Spirit. 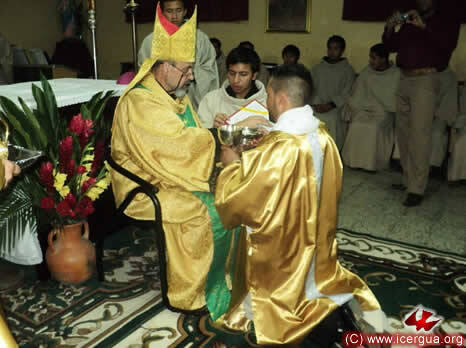 The sub-deacon is responsible for preparing the elements for the service of the altar, to assist the deacon, to watch over the decoration and cleanliness of what is used at the altar, as well as to present to the deacon the chalice and paten that are to be used in celebrating the Eucharistic sacrifice. Here are the symbols of the ministry that is entrusted to you. Conduct yourself in such a way that in every moment you may be an acceptable sacrifice to God. 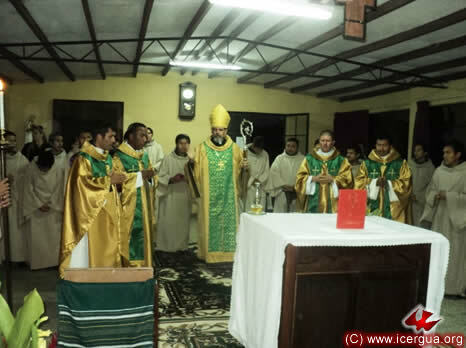 Left: At the end of the ceremony, the new sub-deacons with Father Juan Moisés Mendoza Sapalú, Vice Rector of the Seminary and the person in charge of the education and supervision of those who, like Orlando and Yaider, are doing their EPS (Supervised Field Work). 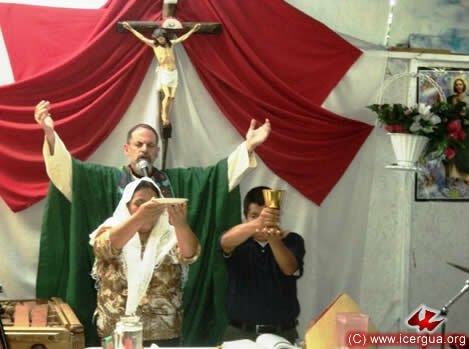 On Saturday, July 9, our bishop Eduardo began his monthly pastoral visit to Los Angeles by celebrating a Eucharist to bless the committee that has been formed there to support Radio Nueva Vida from Nucá, Santa Cruz Barilla. The Association has its office on 36th Street in the southern part of Los Angeles in the rear part of brother Lorenzo’s house. Lorenzo is an enthusiastic promoter of this initiative. At present the Association’s or Committee’s basic initiative is to help collect funds in order to construct the receiving tower, which will enable the transmissions to reach more communities. During the homily, the bishop emphasized that, given that the name of the Committee is “To conquer souls for Christ,” the first stage of its activity has to be to address personal conversion in such a way that Christ may conquer each of us so that we can be effective apostles for him. At the end of the Eucharistic celebration, the members of the Committee wanted to have their picture taken with our bishop. The photograph at left shows all the Committee members. 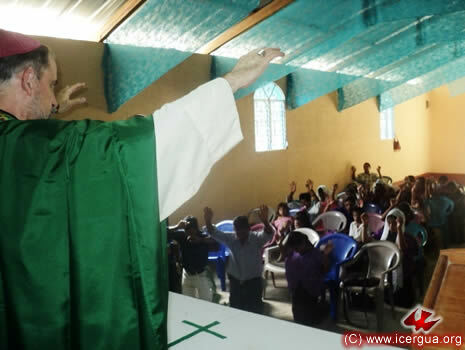 In the afternoon of July 9, Monsignor Eduardo presided at the Eucharistic celebration in the home of the Renewed Catholic Parish of San Miguel Arcángel. The faithful celebrated the opportunity to have the Eucharist with great joy and active participation. During the homily Bishop Eduardo emphasized the importance that each and all Renewed Catholics have a personal encounter with the Lord so that, their own life being transformed, they may be able to give an authentic witness to the Christian life and the Gospel in the world. 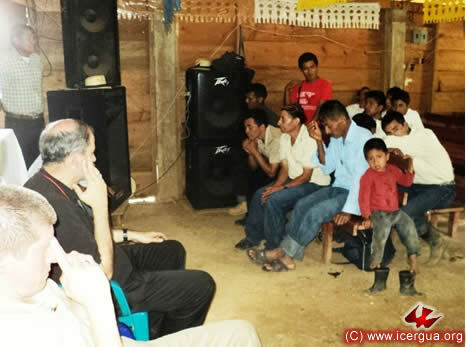 In late afternoon Monsignor Eduardo visited the Pacto Divino Community. In spite of the difficulties it is facing, the faithful are very enthusiastic. Recently the musical ministry offered a concert of Christian music which drew a number of participants and conferred much blessing. 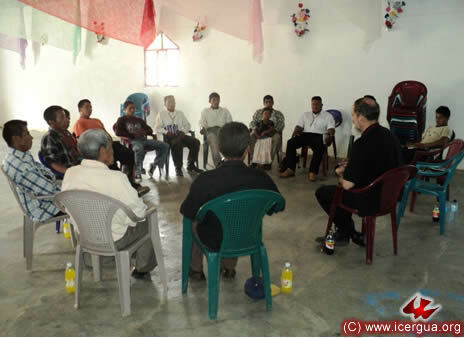 Brother Nicolás, the communion minister and sub-coordinator of the community, urged the bishop to send them materials with information about the Church to help stimulate sustained growth in awareness of our identity. Above: The bishop inviting the People of God to prayer before beginning the Eucharistic Prayer. Right: The bishop and sister Eulalia distributing the holy elements to those prepared to received communion. 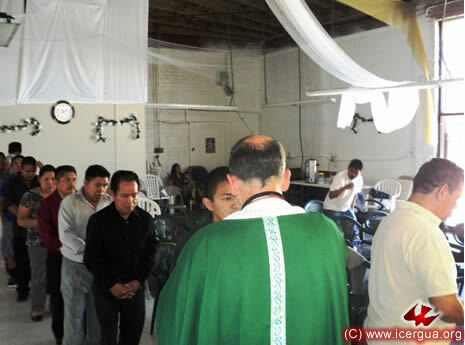 In the evening Monsignor Eduardo presided at the celebration of the Eucharist with the Restauración Community, which meets at the corner of Third Street and Alvarado in central Los Angeles. 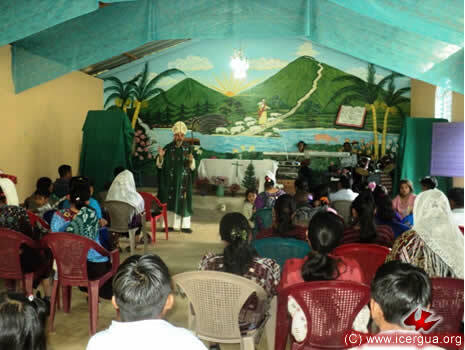 The faithful have been progressively developing various ministries in order that the faithful may participate actively in the liturgical celebration. Now they have a team of readers and communion ministers. Some of them participated in other churches before they felt called by the Lord to join our Church. Beginning last month, as the June Newsletter reported, the faithful now have the permanent presence of the Most Holy Sacrament. This presence has allowed them to participate in Eucharistic Communion throughout the month, which has filled them with joy. 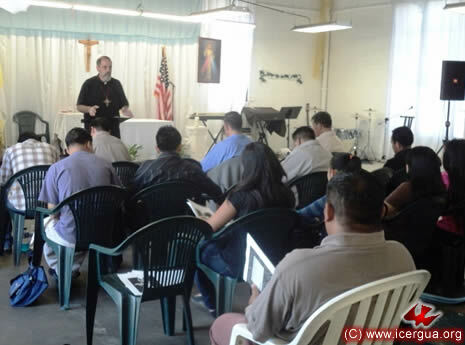 On Sunday morning, July 10, the DETYM classes were held in the central see of the Parish and also in the El Pescador Ministry. With the classes that day the courses on Christology and Introduction to the Synoptic Gospels ended. 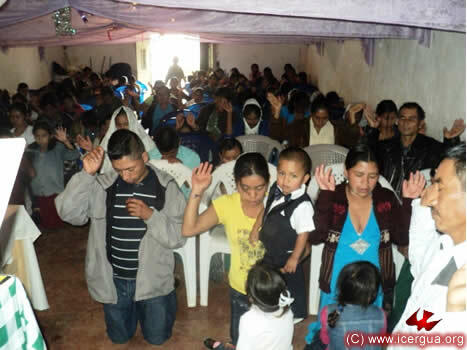 Although the instruction is at the basic level, the faithful have expressed their gratitude for the growth that they have continued to experience. After the instruction, the bishop presided at the Sunday Eucharist with the faithful who were present. Left: The bishop giving the greeting of peace to one of the participants. 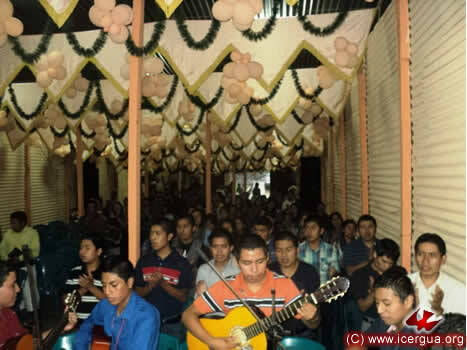 In the background is the music ministry that enlivened the celebration with the marimba and other Guatemalan instruments. 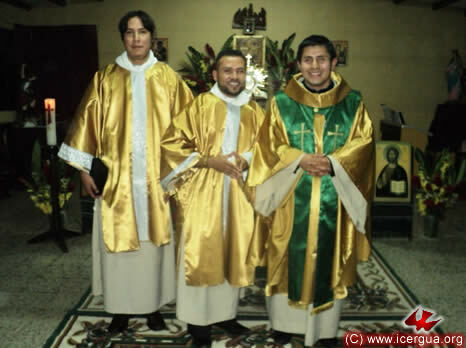 Brothers Ramón and Jorge served as Communion Ministers and a young man was the altar boy. Right: The communion ministers presenting the offerings of bread and wine for the celebration of the sacrifice. Participation in the communion was huge. On the day before, almost all the faithful had attended the Sacrament of Reconciliation and were prepared to come forward to receive communion. 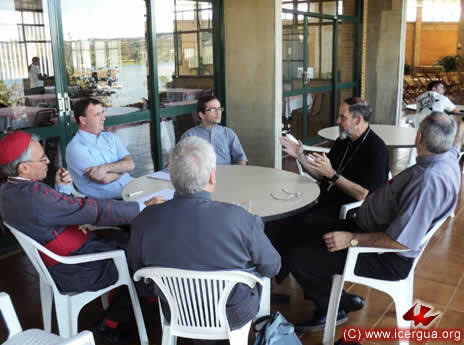 From July 11 to 15, the Catholic Apostolic Church of Brazil (ICAB) celebrated its 21st Plenary Council. Our bishop was the special guest specifically invited to preside at a Eucharist dedicated to reflecting on and praying for unity. 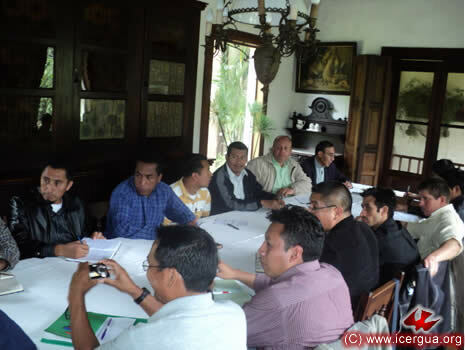 He was also asked to consult with the Council on questions related to ICAB missions. On Monday, July 14, The Eucharist for Unity was celebrated. In the light of the readings for the day, Monsignor Eduardo compared our churches’ ministry to that which the Lord entrusted to Moses, as recorded in Exodus 3, and to that of Jesus, which invites those who are weary and heavy-laden to join him. Monsignor Eduardo’s homily stressed that what enables us to perform our mission is the transforming encounter with the Lord, like that of Moses in the desert. This implies inwardly living the experience of being elected by the Lord, of having a transformed heart, and of knowing how to face gently, patiently, and confidently the problems that have to be confronted to carry to the People of God from slavery to liberty, from the experience of fear to the experience of being sons of God and heirs of the Kingdom. 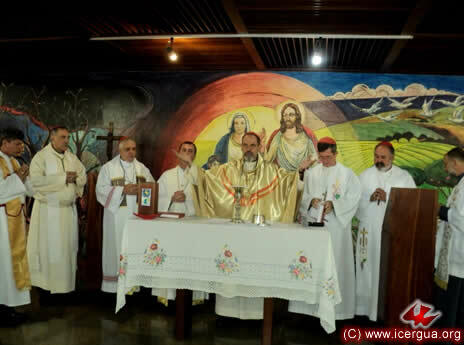 Principal concelebrants in the Eucharist were Brazilian bishops Dom Wagner, ICAB Chancellor, Dom Romeo, vice President of CICAM, and Dom Aurio, Vice Present of ICAB and member of the CICAM steering committee. Also concelebrating were Argentinian bishops Monsignors Gustavo Gabucci and Ricardo Janeiro as well as the bishop-elect of the Paraguay mission, Rafael Ruíz Gaona. 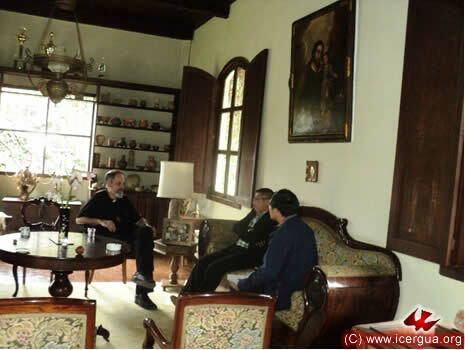 On July 14, before the Plenary session of the Council met to learn about and consider questions concerning the Missions and Congregations of ICAB in Argentina, Monsignor Eduardo was invited to meet with the President of ICAB (Dom Josivaldo Pereira), the Chancellor (Dom Wagner) and with the Directory of the Rosa Mística Institute of Argentina (Monsignor Gustavo Bagucci and Father Luís) as well as Monsignor Ricardo Janeiro. In the photograph at left can be seen this meeting in progress. The meeting took place in the Israel Inheiro Conventional Center in the outskirts of Brasilia. Reflected in the dining-room window is a view of the lovely lake on whose banks the Convention Center is located. 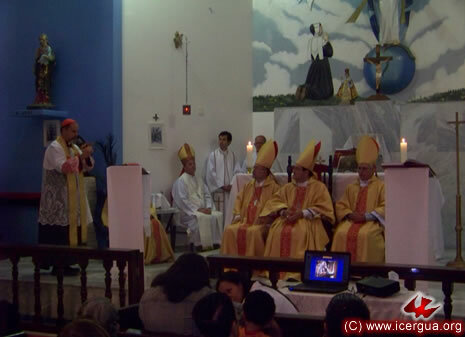 On the evening of July 14, several ICAB bishops celebrated the Episcopal consecration of Monsignor Rafael Ruíz Gaona in the Medalla Milagrosa de Brasilia Cathedral. A Paraguayan, he will be charged to coordinate the mission that ICAB is formally opening in Paraguay with the blessing of the Plenary Council. Monsignor Rafael asked our bishop to give the homily following the consecration. In the light of the biblical readings, Bishop Eduardo emphasized the continuity between the mission that Jesus entrusted to his apostles and the mission that the Father assigned to the Son. He underlined the fact that training for this mission is built on experiencing the outpouring of the Holy Spirit, which transforms fear into courage and empowers the exercise of the ministry. Likewise he indicated that ordination is to confer the Holy Spirit that empowers the apostolic mission, for which one must be open to experience existentially the transforming presence of the Spirit. 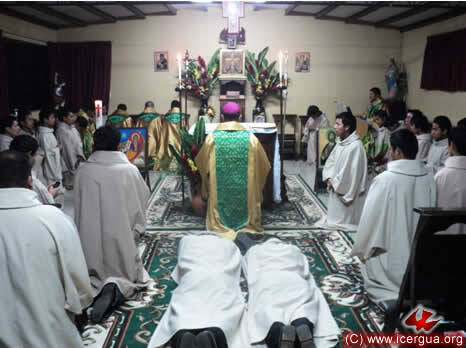 Left: The Litany of the Saints, during which the candidate is prostrate. The consecrating bishop was Dom Manuel de Rocha Neto, Bishop of Foz de Igauzú. 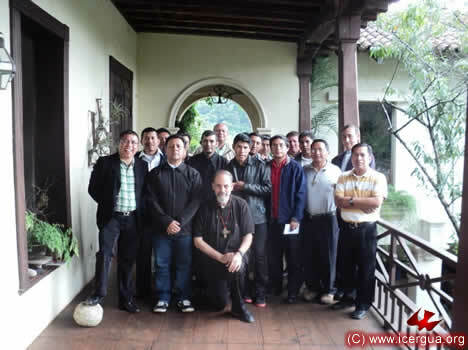 Dom Josivaldo, President of ICAB, was co-consecrator. 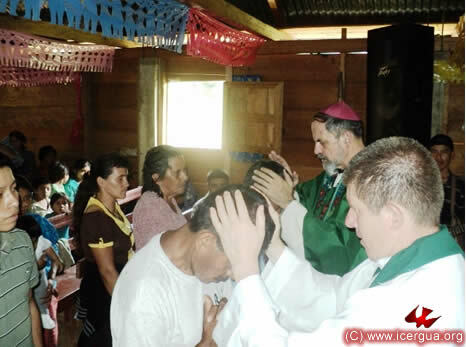 The laying on of hands also involved Dom Wagner (the Chancellor) Dom Gustavo Gabucci (Superior of the Rosa Mística Institute of Argentina), Dom Lucas (Auxiliary of Brasilia), and Dom Wilson (an ICAB bishop). On Thursday, July 21, our bishop received the directors of the Semillas de Fe y de Amor Community, located in Zone 18 of Guatemala City. Originally called “Anawuim,” this community has gone through a series of difficulties, leading to a reorganization. During this visit with our bishop, they reaffirmed their commitment to our Church and their determination to go forward as a Renewed Catholic Community. 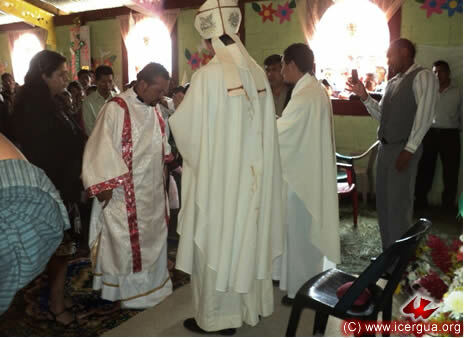 On Friday, July 22, the pastoral responsibilities of Bishop Eduardo began in Nabaj, El Quiché, where the Deanery was celebrated with representatives of all the communities of this municipality. 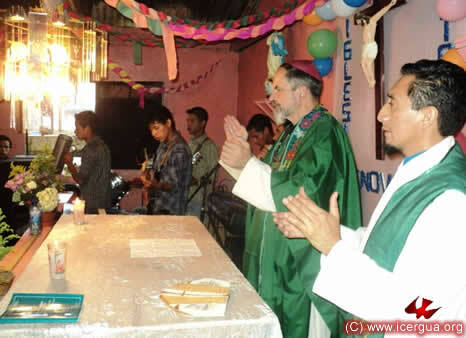 Beginning July 1, the Church has rented a house that serves as the residence for Father Marco Tulio, pastor of this parish, and as the meeting center for Deanery activities. 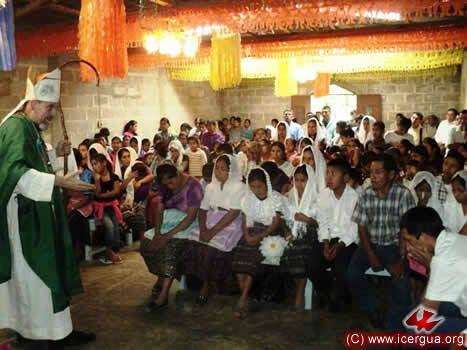 In the center of Nebaj there are four Renewed Catholic communities, all of which are growing. 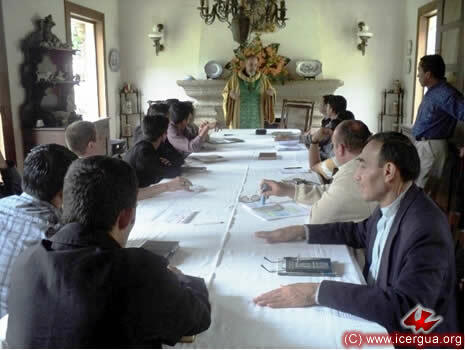 During the meeting successes and difficulties were shared: the Pastoral House and what it offers, the establishment of the Association of Preachers, created to coordinate the various activities of the area, the completion of the construction of another church in the center of Nebaj, and so on. In general the mood was very positive and enthusiastic. 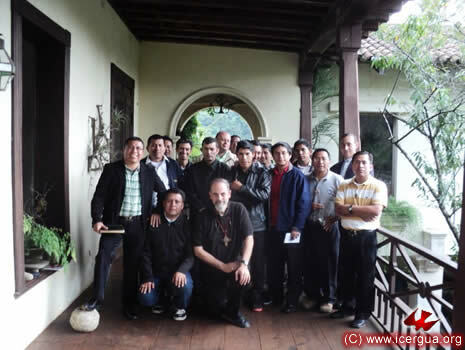 It is hoped that next year one of the seminarians will be doing his supervised field work in this area. 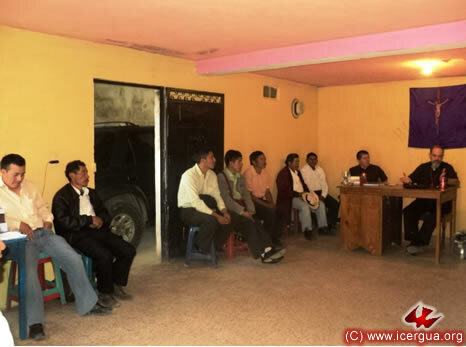 In the afternoon the bishop had a meeting with the two dozen faithful that comprise the council of the Central Chajul Community, which recently joined our Church. 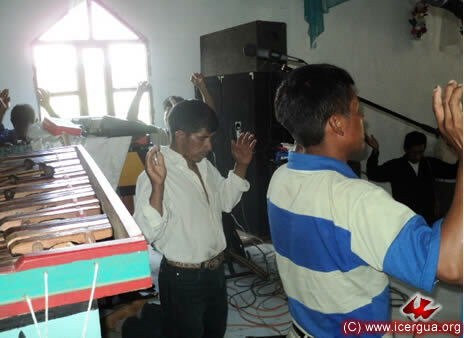 Up to now, the Church has been present only through the Martyrs of Chajul Community in the northern villages. Now, having a community in the center offers new opportunities for evangelizing. 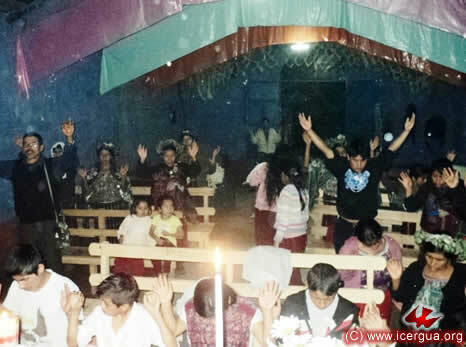 The faithful are very enthusiastic, although they have little experience, training, or resources. Among their plans are the construction of a temporary house of prayer near the center of town on a lot that has been loaned to them. After the meeting, the bishop presided at the Eucharist with the members of the new community. During the liturgical celebration the twelve members of the council were prayed for and blessed. 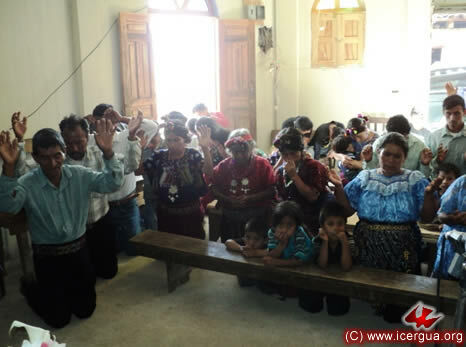 Above: The faithful praying after confessing their sins. Right: The bishop during the homily, which was based on the story of Mary Magdalene, whose festival was celebrated on that day. In view of the fact that the leader of the coordinating team is a sister, the bishop emphasized the importance of the mission that women have in evangelism, as is shown by the fact that the first witness to the apostles of Christ’s resurrection was that of Mary Magdalene, a woman whose life was changed on meeting Jesus and who followed the Master faithfully. 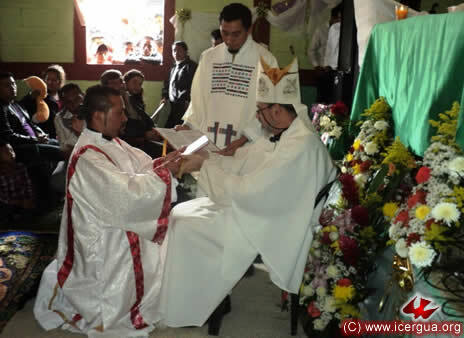 Left: The bishop giving the Holy Communion to sister Juana, the coordinator of the new community. 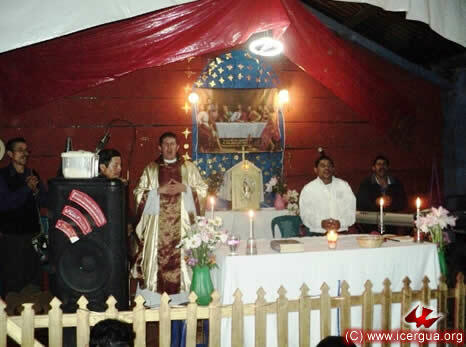 In the evening Monsignor Eduardo presided at the Eucharist with the Tu Manzano Community in the center of Nebaj. During the ceremony six young people completed their Christian Initiation, being chrismated and receiving communion. The young people had been beautifully prepared and radiated spirituality during the entire course of the ceremony in which they participated. Right: The young people who had just been chrismated praying intensely for the outpouring of the Holy Spirit on them. 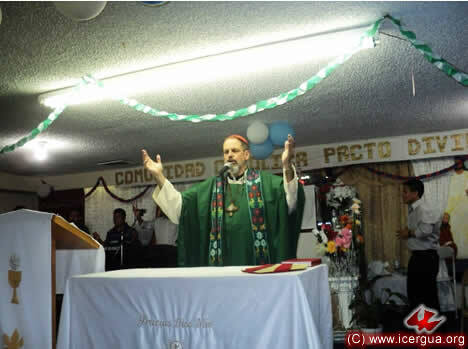 Father Marco Tulio, pastor in the area, co-celebrated in the celebration. 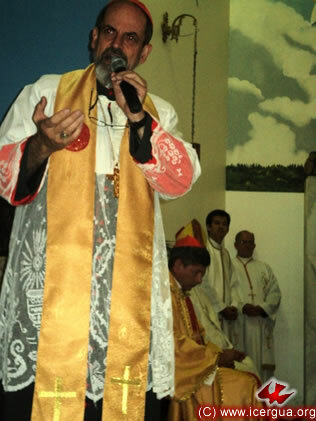 Left: Father Marco Tulio. flanked by the Communion Ministers. The bishop was distributing communion to the participants. 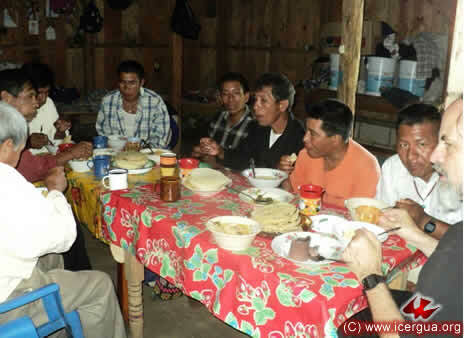 On Saturday morning, July 23, the Deanery of Chajul met in the village of Ilom. The faithful thanked the bishop profusely for the opportunity of meeting every quarter year to share their concerns and gain a clear sense of direction for facing their problems. Left: Brother Marcos, representative from the Santa Delfina Community, informing the Deanery of the difficulties that the community has had and how they have been confronted. 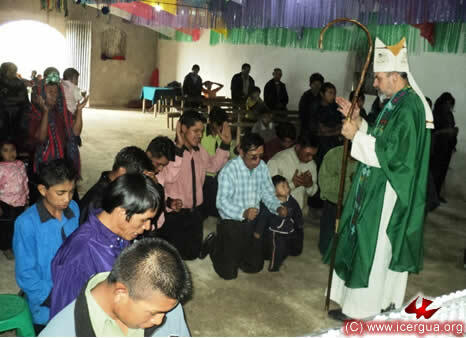 After hearing about the problems and listening to the Assembly’s dialogue, the bishop presented the Pastoral Letter, “I Saw a New Heaven and New Earth,” which offers the community clear standards for their participation in community and social life. The ensuing dialogue was beneficial and helped to stimulate reflection about what the basic commitment should be vis-à-vis the social and political problems that afflict our people. In the afternoon, still in Ilom, Monsignor Eduardo presided at the Eucharistic celebration. It began with the administration of the Sacrament of Reconciliation, after the communal confession of sins. 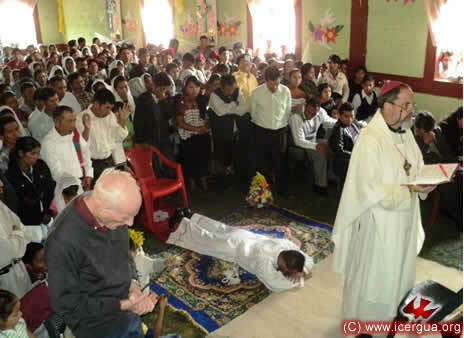 Left: Father Marco Tulio and Monsignor Eduardo administering Absolution to the faithful who had confessed their sins. During the celebration Christian Initiation was administered to a child, José Trinidad. 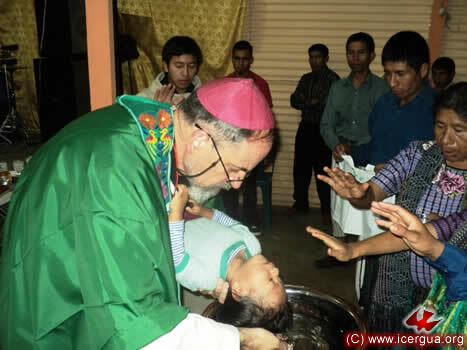 Right: The bishop celebrating the baptism of an infant. Left: The communion ministers presenting the gifts that were to serve for the celebration. At the end of the celebration the bishop gave special greetings to the delegates from the different communities who had been able to stay for the Eucharist after the Deanery meeting. 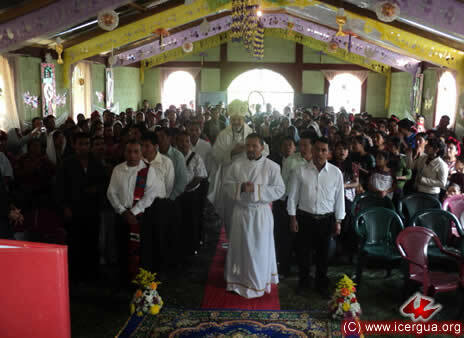 On the afternoon of July 28, the bishop’s visit and the celebration of the Eucharist initiated the celebrations for the anniversary of the spiritual renewal of the Pajomel Community. The faithful had prepared a beautiful rug. The celebrations lasted through Sunday and included more and more representatives of the neighboring communities. For the occasion, a group of children had been prepared to complete their Christian Initiation by receiving communion after making their first confession. Right: The bishop absolving each of the children who had confessed their sins. 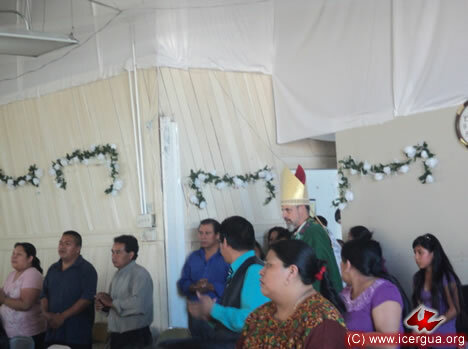 The celebration had been preceded by several days of fasting and prayer which culminated with the majority of the faithful of the community receiving communion. 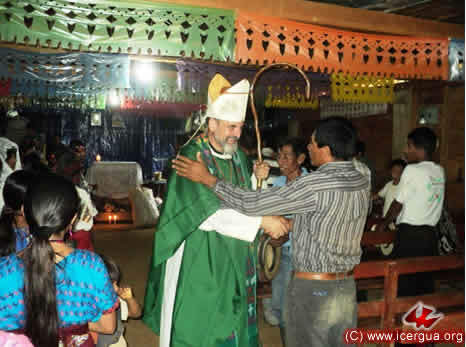 In the evening of July 28, the bishop celebrated the Eucharist with the Chuitzanchaj Community. All the faithful were eagerly awaiting the monthly celebration. 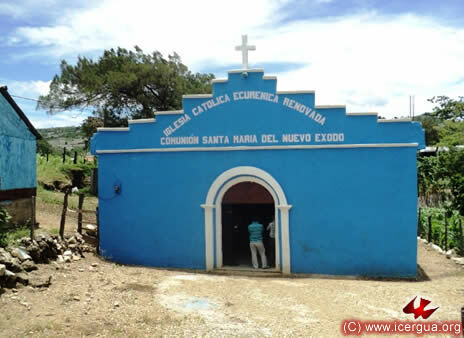 On Friday, July 29, there began the series of deanery meetings in the Huista area, which is in the western part of the Department of Huehuetenango. Representatives from all the communities arrived very early for the meeting. The meeting began with the representatives reporting on the situation in their respective communities. Father Santos, pastor of the area, contributed his presentation after those of the representatives. The positive aspects outweighed the negative ones by far. The communities without exception are continuing to grow rapidly, and peace and harmony prevail in the midst of all, in spite of some difficulties that arose during the last quarter year. For the bishop, hearing the plans described by each of the faithful occupies a very important place in the deanery meeting. 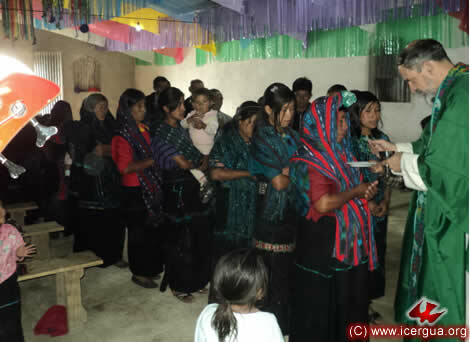 At the end, the bishop took up several questions that had been raised and then offered instruction based on the Pastoral Letter, “I Saw a New Heaven and a New Earth.” It was well received by everyone, and 150 copies of the document were distributed for the faithful to study with their communities. 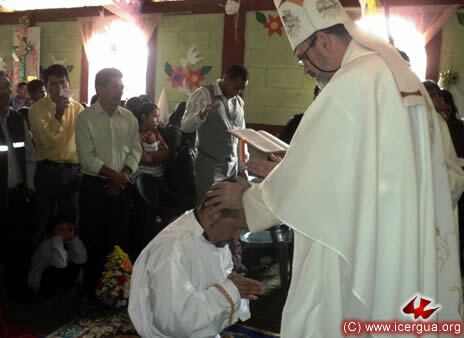 In the afternoon of July 29, the bishop visited the central community of Concepción Huista. The brothers had prepared a beautiful reception for the bishop. 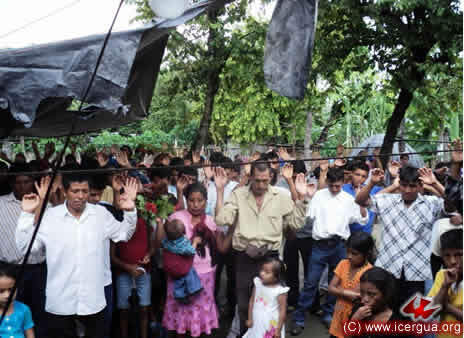 The Community of Central Concepción Huista has experienced powerful growth recently, not only in numbers but also in commitment and spiritual dedication. During the homily the bishop urged the faithful to continue working intensely in evangelism and in the renewal of families in order to carry out the mission that the Lord has entrusted to us. 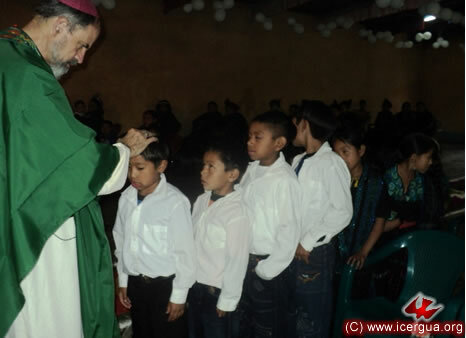 In the evening the bishop presided at the Eucharist with the ever-growing community in the center of Jacaltenango. 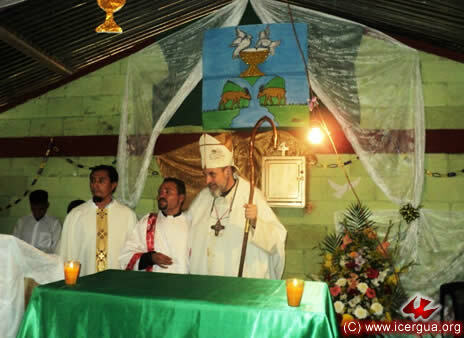 Father Santo, pastor for the area co-celebrated; he had accompanied the bishop during every activity. 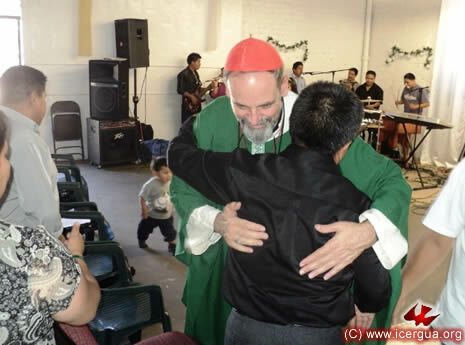 Through God’s blessing, the communities throughout the area have continued to grow intensely and to give witness to what it means to live as the one, holy, catholic and apostolic Church. During the homily the bishop spoke of Saint Martha, whose liturgical feast day was celebrated on that date, as an example of the attitude that should characterize Renewed Catholics: serving the Lord and proclaiming the Good News through generously serving others. At the end of the celebration a forty-day old child was brought forward to be presented. The bishop invited all the children participating to unite in prayer, asking blessings for the child and her family. 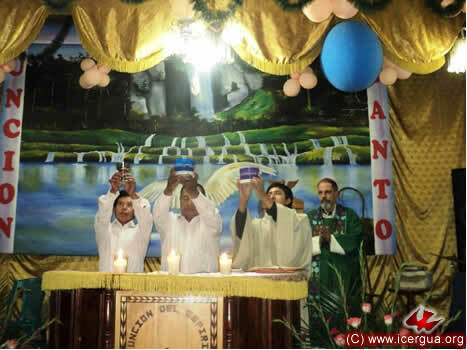 On the morning of July 30 the Deanery of Nentón, in the northwest of Huehuetenango, was celebrated. There were representatives from almost all the communities. 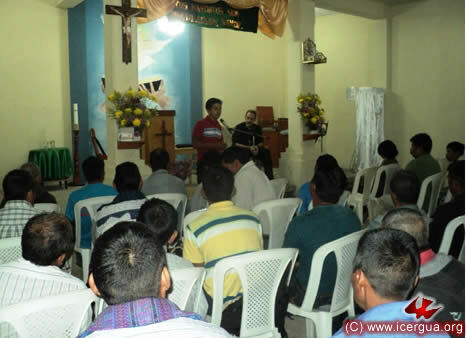 The meeting was held of the Guaxacaná church. 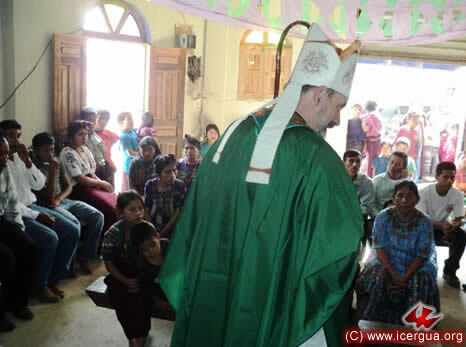 The faithful reported on the successes that they had had in the last three months: the rise of two new communities (which the bishop was to visit on the same day). They also talked about the evangelizing project that they are conducting. After listening to the presentation from the representative of each community and making comments on them, the bishop began instruction on the Third Pastoral Letter. The deanery meeting ended with lunch, which the bishop shared with the representatives. 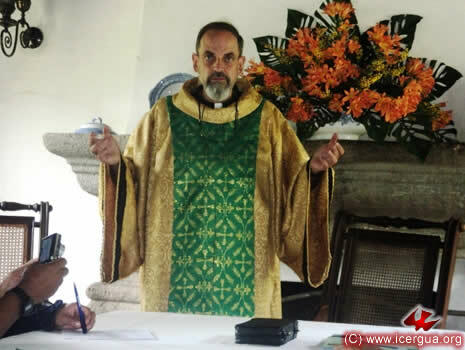 For more than a year, brother Julián Bal has been responsible for the pastoral organization of the area around this deanery. His commitment and dedication is producing abundant fruits. 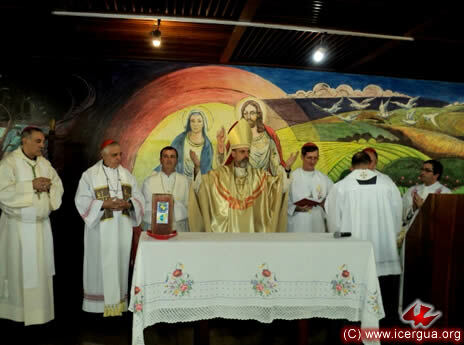 In the afternoon, the bishop presided at the celebration of the Eucharist with Renewed Catholic Community of Guaxacaná. In the photograph at left can be seen the façade of the beautiful church that the faithful have built, in which their religious and ecclesial identity is clearly expressed. The celebration began with the administration of the Sacrament of Reconciliation. Right: The members of the music ministry making the confession of their sins. Left: After the confession some of the sisters who had confessed their sins came forward to receive absolution. 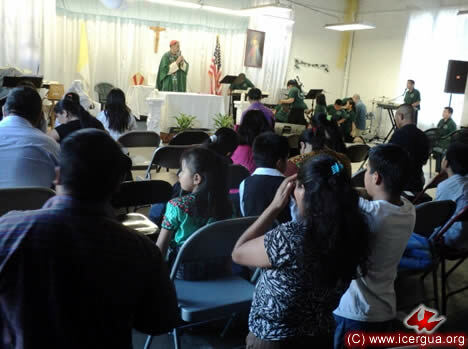 In mid afternoon, the bishop visited the Nuevo San Mateo Community. Comprising about twelve families and 110 members, it is one of the two communities that has recently made a covenant with the Church. It was the bishop’s first visit. 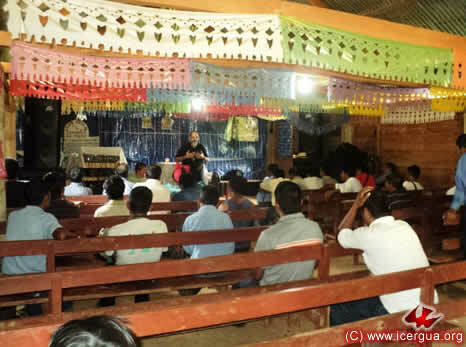 The faithful do not yet have a church, but are committed to continue working and evangelizing to draw in more members and to have a permanent place of worship. 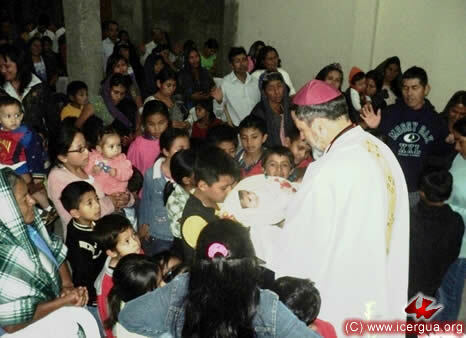 On the bishop’s visit sixteen children were initiated into Christian Life. The parents and sponsors had been diligently prepared by Julián Bal. 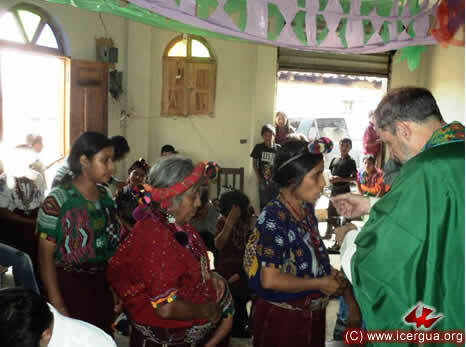 In late afternoon the bishop visited the other community that has recently joined ICERGUA. 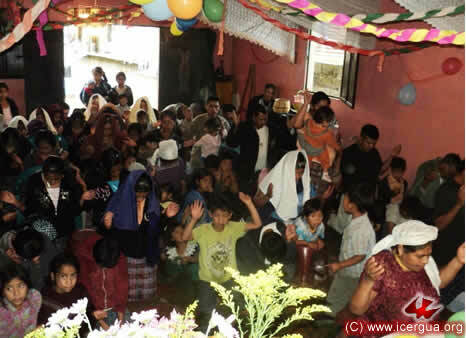 It is called La Fortuna, and consists of thirty-eight families that up to now have not had any opportunity for ecclesial participation in any church. This situation reflects their lack of instruction. 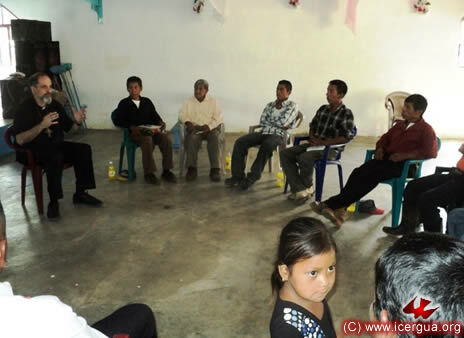 However, all had been prepared carefully with respect to what was involved in joining ICERGUA and taking on the firm commitment to continue this preparation until every family can be fully integrated into the community. 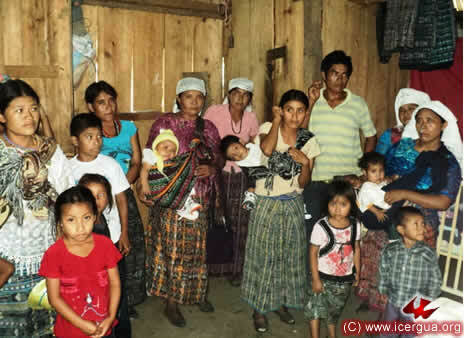 Having been religiously abandoned, this community had forty-six children that wanted to be initiated into Christian Life. 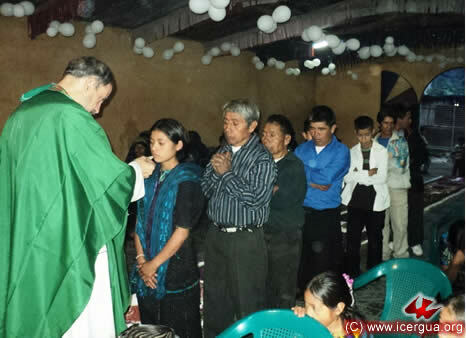 The parents had received catechetical instruction and accepted the commitment to live out the faith and to regulate their life entirely by it. In addition to brother Julián Bal, brother José accompanied the bishop. José is the coordinator of the Subajasú Community. There were also brothers from other Nentón communities. 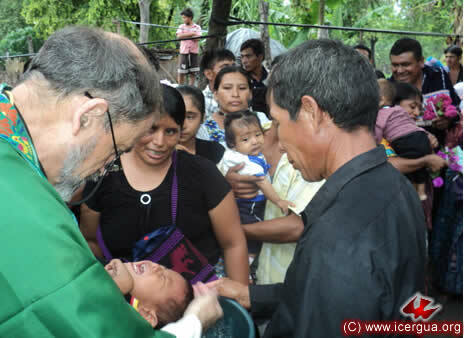 Left: Brother José with the bishop during the baptism of the children. 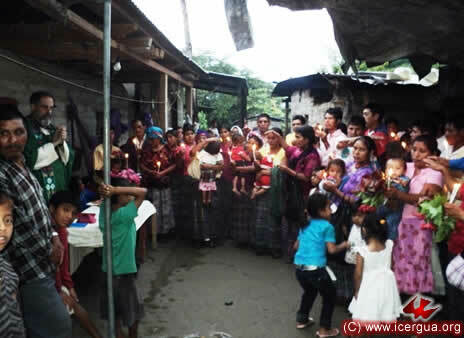 The sky was tinted with enchanting sunset colors at the end of the afternoon and candles were lit for those whose Christian Life had been initiated, lighting also the hope of these communities that have up to now lived in religious abandonment, but from now on will live out the Catholic faith fully. 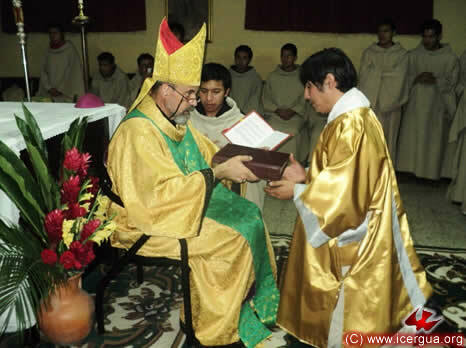 On Sunday morning, July 31, in the Los Coles church, San Pedro Necta, the bishop presided at the celebration of the ordination to the diaconate of the Reverend Sub-Deacon Yaider Jiménez. Yaider, by nationality a Columbian, came to us six years ago. 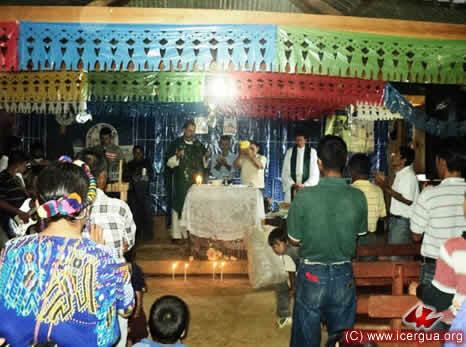 He did his supervised field work in the communities of San Pedro Necta, which thanks to his commitment and dedication have experienced sustained growth and now are ready to be established as a parish. 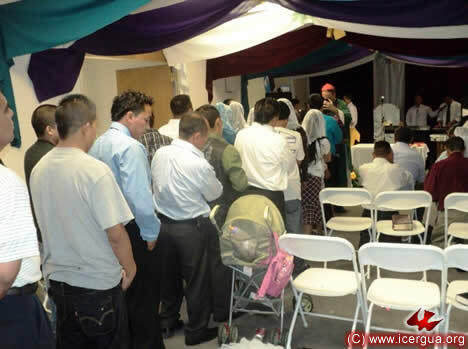 In spite of scheduling difficulties, the church and all the area around it were filled with parishioners. Everyone attended with joy and an attitude of continuous participation. Right: The confession of sins. A particularly significant moment in the ordination is the singing of the Litany of the Saints. 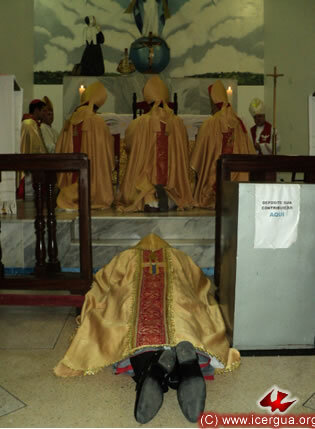 Left: Yaider prostrate while the Assembly, standing, sings the intercessory song. Without doubt the culminating moment in the ordination is the laying on of hands and the consecrating prayer. Right: The bishop laying hands on Yaider and praying that he may receive the Holy Spirit and be a Deacon. After the prayer of ordination, the candidate is clothed with the vestments specific to his ministry—the stole and the dalmatic. 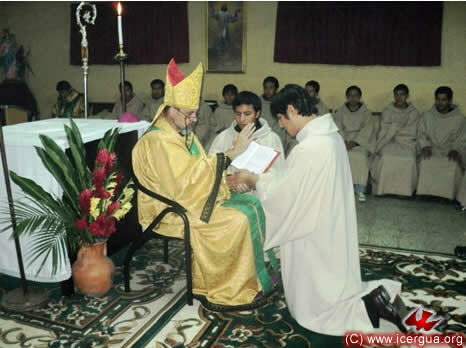 Left: The bishop, accompanied by Father Santos, completing the process of re-vesting the new deacon. The ordination ceremony ends with the delivery of the book of the Gospels, indicating the deacon’s basic mission to read it publicly, and to proclaim and live out the gospel of Jesus Christ. Right: At the end of the Eucharist, the new deacon Yaider, thanking the bishop, Father Santos and all the People of God for the ministry received and promising to live with faithfulness and radical dedication.